Rhone Street Gardens: Dreaming of A House With New Paint! There is no way we can afford to paint the house right now...and realistically, not for years to come...but it's nice to dream, eh! I've always wanted a red house (barn red), but after playing around in photoshop, I'm rather partial to the green and brown...hmmm. Not a comment on your house but i saw your question about stock tanks on some PNW plant forum that is did not want to join just to post a reply. There's one in Gresham as well. Very cute! There's one down the street from me that looks a lot like yours. It's butter yellow with black trim. I'd love to see what it would look like olive green (top right), with mustard (2nd row right) trim. 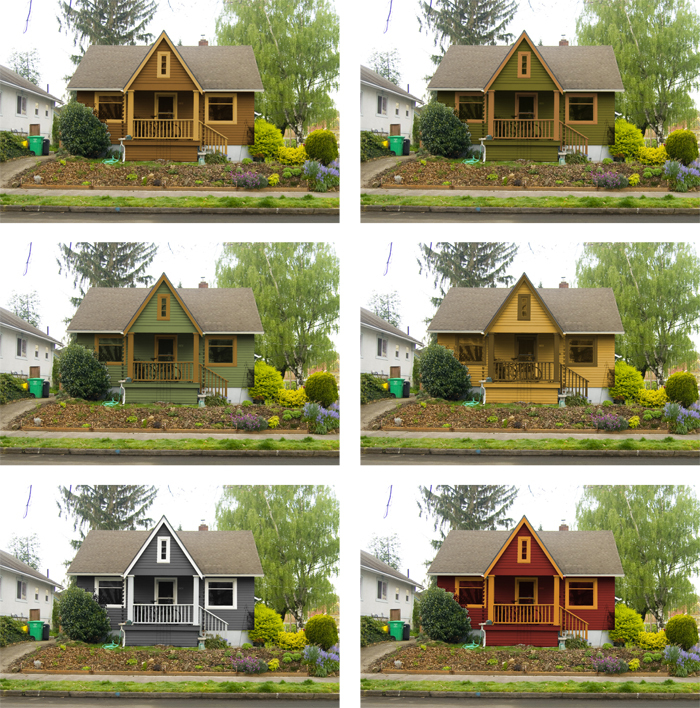 Or just flip/reverse the color application for the mustard house.